A regular breeding species throughout the forested areas of the state and a common spring and fall migrant. The species was very abundant during the Minnesota Breeding Bird Atlas (MNBBA). The Red-eyed Vireo is widely distributed in the eastern United States and the southern boreal forest across all of the Canadian provinces to British Columbia (Figure 1). Red-eyed Vireos are especially abundant in areas of northern Minnesota and Wisconsin, several places in Ontario and the New England states, as well as western Pennsylvania and northwestern Arkansas. Long-distance Neotropical migrant that over-winters in northern South America. Insectivorous, feeding especially on caterpillars gleaned from foliage. Pensile cup nest suspended from the end of a branch in a tree or shrub. Breeding distribution and relative abundance of the Red-eyed Vireo in North America based on the federal Breeding Bird Survey from 2011 to 2015 (Sauer et al. 2017). Roberts (1932) described the Red-eyed Vireo as “an abundant summer resident throughout the state wherever there are trees” and as one of the most “generally distributed birds.” He listed the confirmed county nesting records as not excessive in number but extensive in distribution across the state. He included documentation from Wabasha and Goodhue Counties in southeastern Minnesota, from Hennepin and Sherburne Counties and Mille Lacs in the east-central part of the state, from Cass and Marshall Counties in the northwest, and in Itasca, Lake, and St. Louis Counties in the northeast. All of these records included nests with eggs, except ones in Goodhue (nests only), Mille Lacs (nest, nest building, and young out of the nest), and St. Louis (young out of the nests). He also thought that the species is a “common inhabitant of the natural groves and timber-claims of the western prairies” and so likely a nesting species where suitable habitat existed. Green and Janssen (1975), more than forty years later, described the Red-eyed Vireo simply as a “resident throughout the state” and the “most widespread and numerous vireo species.” Janssen (1987) emphasized it was a numerous resident “throughout the heavily wooded areas of the state” and “least numerous in the southwest region.” Janssen, along with Hertzel and Janssen (1998), documented and considerably expanded confirmed nesting since 1970 in counties ranging from Houston County in the extreme southeast, to Murray County in the southwest, to Roseau County in the northwest, and to Cook County in the northeast. The Minnesota Biological Survey illustrated the wide distribution of breeding locations throughout the state with a total of 4,253 records (Minnesota Department of Natural Resources 2016). No locations were included from many western Minnesota counties, such as Big Stone, Norman, Pipestone, and Wilkin. These were also counties without confirmed nesting records in Janssen (1987) or Hertzel and Janssen (1998). Breeding observations were also sparse in many counties in southwestern Minnesota, except along the Minnesota River and its forested floodplain. The MNBBA recorded 7,380 records and identified possible breeding observations from every county in the state (Figure 2). Breeding records were recorded in 61.8% (2,952/4,777) of blocks covered in the MNBBA (Figure 3; Table 1). Cottonwood, Grant, Lincoln, Martin, Pipestone, Redwood, Stevens, Watonwan, and Wilkin Counties had only one possible nesting record. All other counties had probable or confirmed nesting observations. An additional 17 counties had confirmed nesting records not previously cited by Janssen (1987) or Hertzel and Janssen (1998). However, as noted, definitions for nesting activity vary between the MNBBA and those used by the Minnesota Ornithologists Union. The MNBBA probability map illustrates the extensive distribution of the Red-eyed Vireo throughout the state with the highest densities predicted in the heavily forested regions of northeastern and north-central Minnesota (Figure 4). Outside of this region densities are also relatively high in northwestern, western, south central, and in southeastern Minnesota, especially along forested river valleys. Red-eyed Vireos can be found almost anywhere there is suitable forested areas, including woodlots in agricultural and urbanized regions. The Red-eyed Vireo has likely become less abundant in Minnesota compared with the mid-1850s because of the loss of more than 40% of forested area in the state. It is, however, still a very abundant species. Its breeding distribution was more extensive in Wisconsin, where it was found in 91% of priority blocks (Cutright et al. 2006). In addition, Cimprich et al. (2000) in their review of the Red-eyed Vireo in North America reported it was expanding in Oregon, Utah, and Newfoundland from the 1920s to 1940s concurrent with the planting of trees in shelterbelts and other landscaping activities. Breeding distribution of the Red-eyed Vireo in Minnesota based on the Breeding Bird Atlas (2009 – 2013). Summary statistics of observations by breeding status category for the Red-eyed Vireo in Minnesota based on all blocks (each 5 km x 5 km) surveyed during the Breeding Bird Atlas (2009-2013). Summary statistics for the Red-eyed Vireo observations by breeding status category for all blocks and priority blocks (each 5 km x 5 km) surveyed during the Minnesota Breeding Bird Atlas (2009-2013). Predicted breeding distribution (pairs per 40 hectares) of the Red-eyed Vireo in Minnesota based on habitat, landscape context, and climate data gathered during the Minnesota Breeding Bird Atlas (2009-2013) using the General Linear Modeling method with an adjustment for detectability. Occurs in a wide variety of upland forests, lowland deciduous forests, and mixed deciduous-coniferous forests as well as in residential areas, city parks, and cemeteries wherever large trees grow (Cimprich et al. 2000). Breeding distributions recorded during the Minnesota National Forest Bird Monitoring (NFB) program (Niemi et al. 2016) indicated wide use of most forest types but highest use of deciduous forest cover types such as oak, aspen-birch, northern hardwoods, and lowland deciduous forests. Moderate use was also noted in many mixed deciduous-coniferous forests such as aspen-fir-spruce, coniferous forests including pine (jack, red, and white) forest types, and regenerating forest cover types (Figure 5). During the MNBBA, the species was observed in most habitats, except for open areas such as cropland, urbanized areas, and open wetlands (Figure 6). .
Robbins et al. (1989) reported the Red-eyed Vireo was sensitive to forest fragmentation. They found that the species occurred in forest patches as small as 0.5 ha but was absent when those forest fragments were isolated. James (1976) found the species was generally absent or rare when understory shrubs were not present. Typical breeding habitat of the Red-eyed Vireo in Minnesota (© Gerald J. Niemi). Habitat profile for the Red-eyed Vireo based on habitats within 200 m of point counts where the species was present during the Minnesota Breeding Bird Atlas (2009-2013). Partners in Flight (PIF) (Rosenberg et al. 2016) estimated a North American population of 130 million breeding adults and had previously estimated 3.9 million adults in Minnesota (Partners in Flight Science Committee 2013). The MNBBA estimate for Minnesota was substantially higher with an estimate of 8.54 million breeding adults (95% confidence interval ranged from 8.20 to 8.94 million). This higher estimate, however, is still only 6% of the Red-eyed Vireo’s global population. The federal Breeding Bird Survey (BBS) in Minnesota for the years 1967–2015 indicated a nonsignificant, stable population trend but tending toward an increase (Figure 7). On a broader scale, over the same time period, Manitoba, Michigan, Ontario, Wisconsin, and survey-wide all showed significant increases ranging from 0.57% to 2.40% per year. PIF (Rosenberg et al. 2016) suggested the population had increased by 43% from 1970 to 2014. 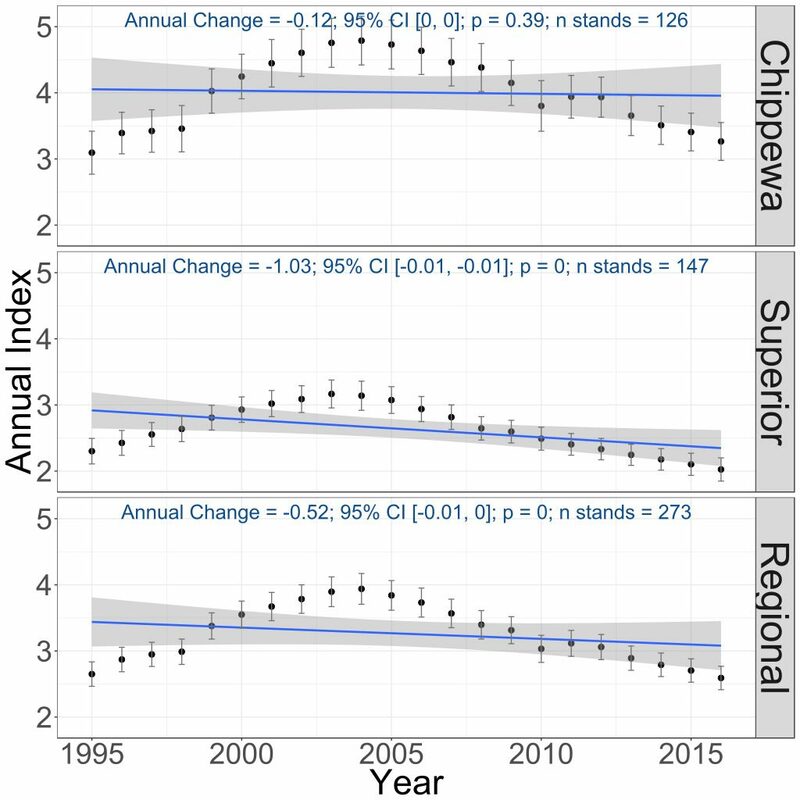 Surprisingly, BBS trends conflicted with the stable trends recorded in the Chippewa National Forest and the significantly decreasing trends in the Superior National Forest in 1995– 2016 (Figure 8). The overall regional trend was a significant decrease of 0.52% per year with the downward trend most pronounced in 2004–2016. In one of the few semi-quantitative surveys completed in the early 1900s, Roberts (1932) stated “in eight walks of a mile or two along different trails in Itasca Park, from July 5 to 16, 1919, over one hundred of these birds were checked.” He probably meant observations of this species and likely most were singing males. Overall mean estimated densities in the Superior and Chippewa National Forests varied from 13.4 pairs/40 ha to 20.1 pairs/40 ha, respectively (Niemi et al. 2016). In many specific forest cover types, the species was the second (to the Ovenbird) most abundant species. The only habitat in which it was the most abundant species was mature oak forest (30.2 pairs/40 ha) in the Chippewa National Forest. Otherwise, mean estimated population densities varied widely, from 3.1 pairs/40 ha and 8.9 pairs/40 ha in lowland black spruce–tamarack and pine forests of the Superior National Forest, respectively, to 32.1 pairs/40 ha in mixed aspen-spruce-fir of the Chippewa National Forest. Densities reported by Cimprich et al. (2000) ranged from as low as 0.8 pairs/40 ha in shrub-dominated habitats in Illinois to the highest reported density of 64 pairs/40 ha in New Hampshire forests. 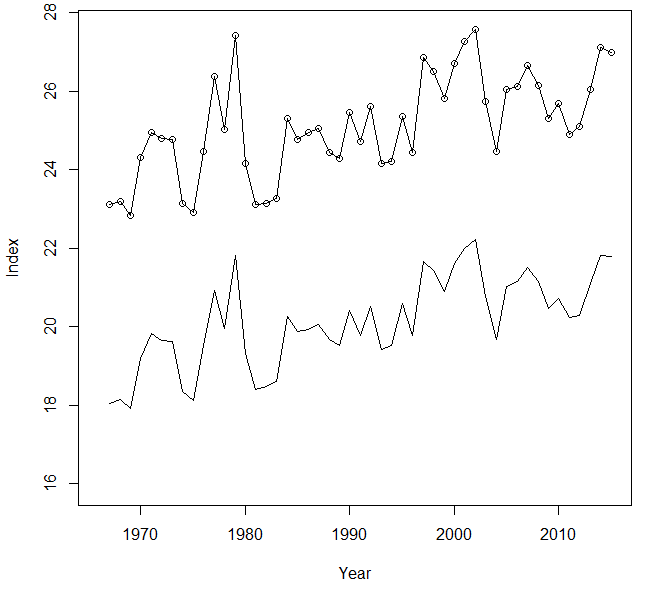 Breeding population trend for the Red-eyed Vireo in Minnesota for 1967–2015 based on the federal Breeding Bird Survey (Sauer et al. 2017). Breeding population trends of the Red-eyed Vireo in the Chippewa and Superior National Forests and the combined regional trend, 1995–2016 (Bednar et al. 2016). The Red-eyed Vireo has a relatively low Continental Concern Score of 6/20 (Rosenberg et al. 2016), and therefore its conservation is of little concern at present. With its wide geographic distribution, large breeding population, and use of many forest and semi-forested habitats, the Red-eyed Vireo is highly adaptable, even frequently using urbanized areas for nesting. It is one of the few species not listed as a species of concern in the climate change analyses reported by Langham et al. (2015) and the National Audubon Society (2015). Cimprich et al. (2000) reported some sensitivity to logging activity, but data from Minnesota suggest the species is tolerant of logging activity, especially if some live trees remain at the site (Grinde et al. 2017). However, population densities in regenerating forests are substantially lower than in intermediate and mature upland forests (Niemi et al. 2016). The Red-eyed Vireo is frequently found at communication towers, but the overall impact on its population is believed to be minimal because of its large population. Ecological data from its wintering grounds in South America are very minimal, and deserve further study. James, Ross D. 1976. “Foraging Behavior and Habitat Selection of Three Species of Vireos in Southern Ontario.” Wilson Bulletin 88: 62–75.